To mark the occasion of the launch of the highly acclaimed Arsènal: the Making of a Modern Superclub (September 2011) (co-authored with Kevin Whitcher), the updated paperback edition of the best-selling book first published in October 2009, Alex Fynn will present an assessment of the current health of the Premier League, and of one of its most successful members, Arsenal Football Club, just as its totemic manager, Arsène Wenger, enters his 16th year as the manager of the club. It is now twenty years since the Premier League was established. In that time the league has developed to become the world’s richest and most popular national domestic league in terms of the revenue it generates and the broadcasting audience it commands internationally. The Premier League would appear to have been very good for its member clubs during its existence. But what about the rest of English football, for whom many commentators would claim the benefits have been less obvious? Alex will present a current health check for the Premier League, and then assess what this means for its future and that of English football in the current turbulent economic times. Alex will then go onto assess the role of Arsenal as a beneficiary of the Premier League, and will pose a provocative question; has Arsenal’s experience in the Premier League been a case of missed opportunity? Is it the case, even with all the club’s built-in advantages – huge turnover, gifted manager, successful youth policy – that the wider structural environment of the Premier League means that Arsenal will inevitably struggle to emulate past glories? 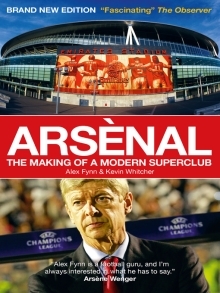 Throughout Alex will draw on extensive interview material from Arsènal: the Making of a Modern Superclub to illustrate why even a club like Arsenal, that is widely acclaimed for the quality of its management leadership, must constantly be re-inventing itself in order to continue to compete in one of the world’s greatest sporting competitions. Alex Fynn is a well-known consultant to the football industry who has also written extensively on the subject of the football business. His clients have included Arsenal, Celtic, Manchester United and Tottenham Hotspur football teams, as well as the Football League and the Football Association. Through his work he has been influential in the formation of both the Premier League and the European Champions League. Previously Alex was a director of the well-known advertising agency Saatchi & Saatchi, latterly as vice-chairman. Throughout his career Alex has acted as an advisor on the negotiation of the sale of TV broadcasting rights for clients such as the Football League and the FA, the latter which led to the award of the first BSkyB television contract. He has advised a number of clubs and federations on media and marketing; including the sale of broadcasting rights by the Polish FA, Galatasaray of Turkey and most recently by Celtic, Blackburn Rovers, Bolton Wanderers, Fulham and West Ham. To take advantage of this offer you need to order the book from the publisher’s website at www.visionsp.co.uk and type the promotion code Fynn into the Promotion Code box on the Shopping Basket & Checkout page.